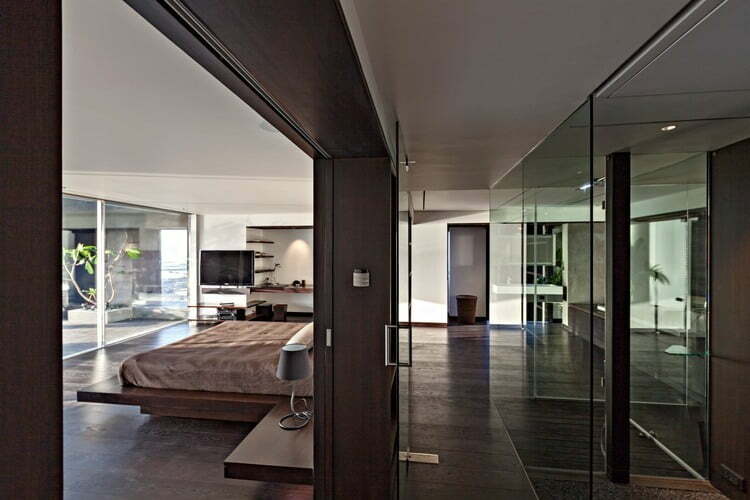 Open Floor Plan Penthouse Interior Design by Abraham John Architects overlooks the Arabian Sea is a project by Indian studio abraham john architects that sees the transformation of a derelict building into a luxurious cliff top penthouse. 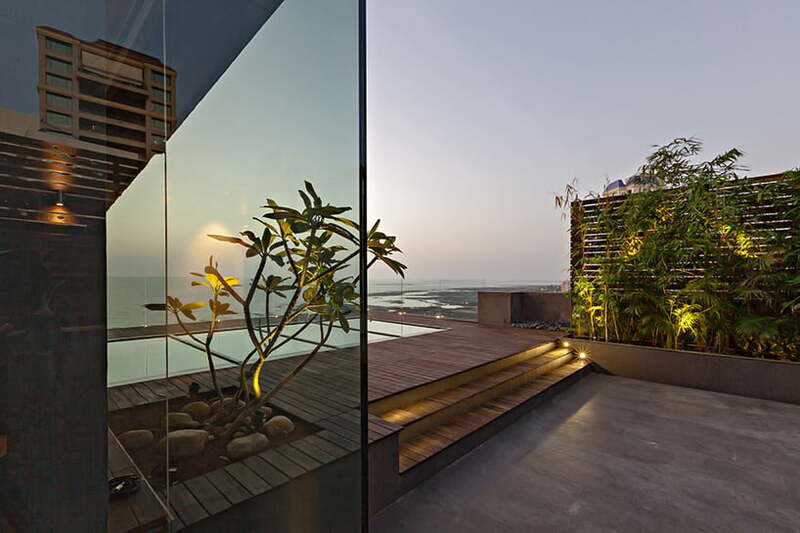 Open Floor Plan Penthouse located in Mumbai, India and the Open Floor Plan Penthouse offers extensive views over the Arabian sea to the west and the tree-lined slopes of Mount Mary hill on the east. The house creates a feeling of openness and connection to the surrounding landscape both visually and physically, with Eco-friendly materials used throughout. 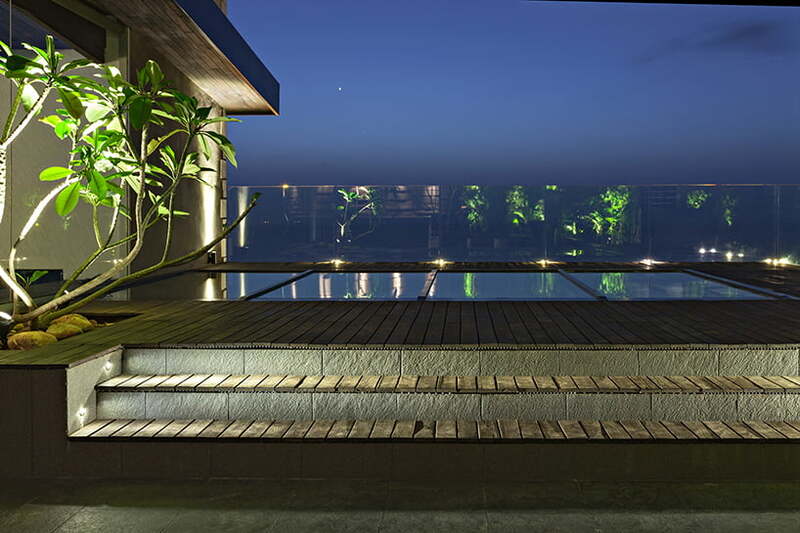 Positioned on top of the 7th and 8th floors of an existing building, the volume takes advantage of this orientation, while addressing strong sea breezes. designed in response to its tropical seaside context, all the rooms face towards the ocean with landscaped terraces helping them blend in with the exterior environment. 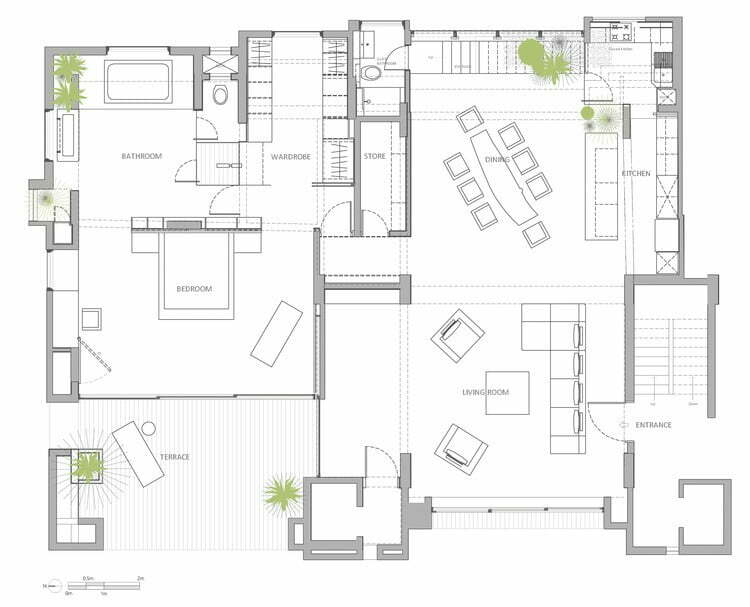 The Open Floor Plan Penthouse also incorporates sustainability features by employing energy-efficient, low consumption technologies. 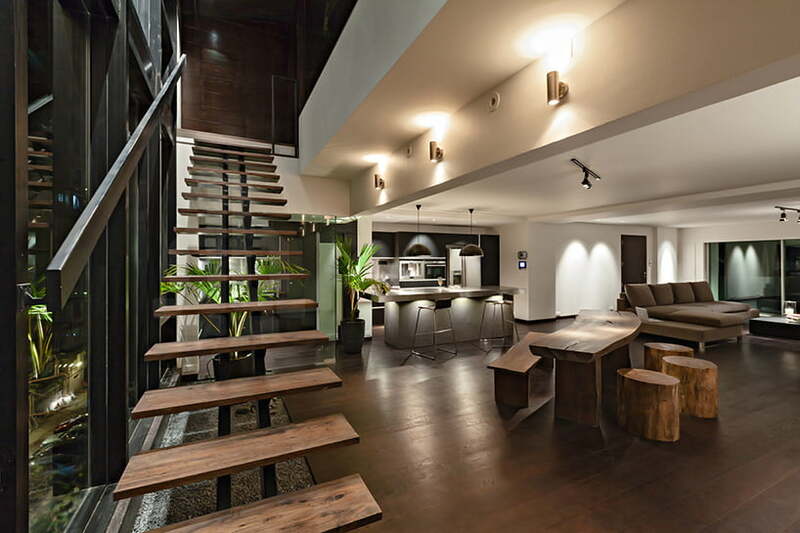 The brief called for the complete remodeling & combining two separate apartments on the top floors of an otherwise unremarkable building into a refined 3500 sft contemporary penthouse suitable to the favorable tropical climate & the cosmopolitan atmosphere of Bombay. 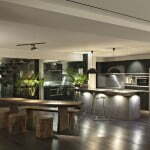 The existing apartments had very different characters and were not in keeping with the client’s requirements. The client wanted a villa in the sky, something more minimalistic, architectural and totally connected with the landscape. 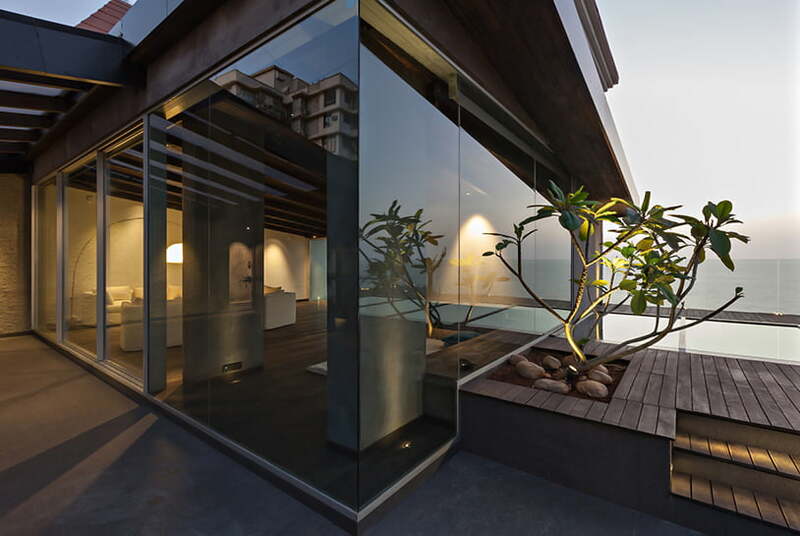 All internal walls were demolished to create an open plan layout and recapture stunning views of the Arabian Sea on the west and tree lined slopes of Mount Mary Hill on the East. Being near the sea and on the 7th& 8thfloors of an existing building, there were many construction challenges, from the logistical point of view & the high velocity sea breeze, further, work had to happen with the consent of the neighbors. A brand new staircase cantilevered off the columns helped connect the two spaces without loading the cantilevered slab; the entire project took a year to complete. 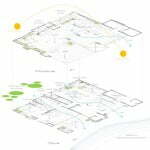 The main design principles followed were of orientation to the natural elements (sun, wind, water), openness and connection with nature at all levels (visual & physical), using natural & Eco-friendly materials. 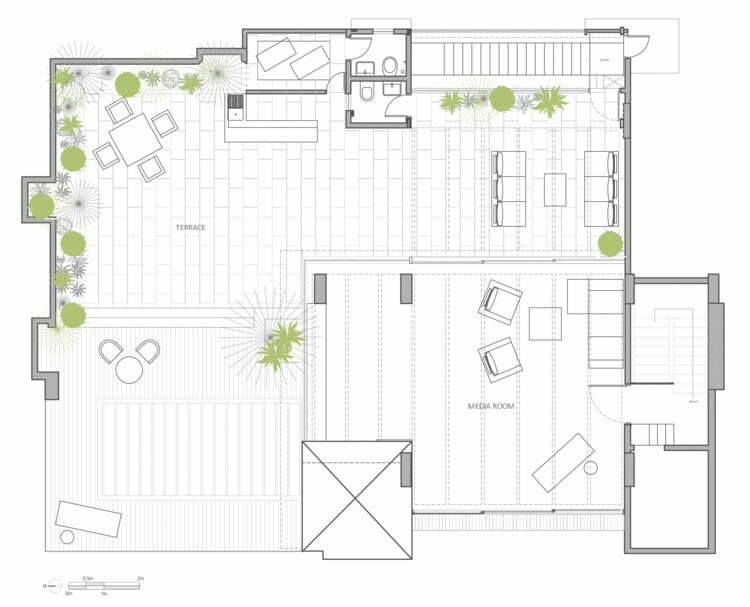 Landscaped terraces and skylights created areas accessible from all rooms in the duplex. 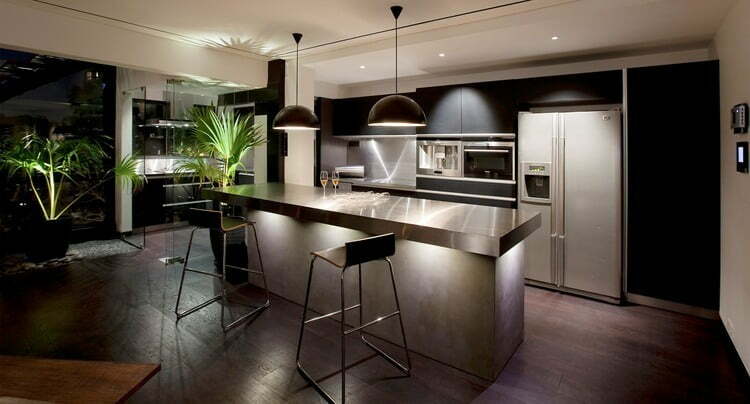 The kitchen is in the south east in keeping with Vastu, (the Indian principle of design) and is flooded with morning light. 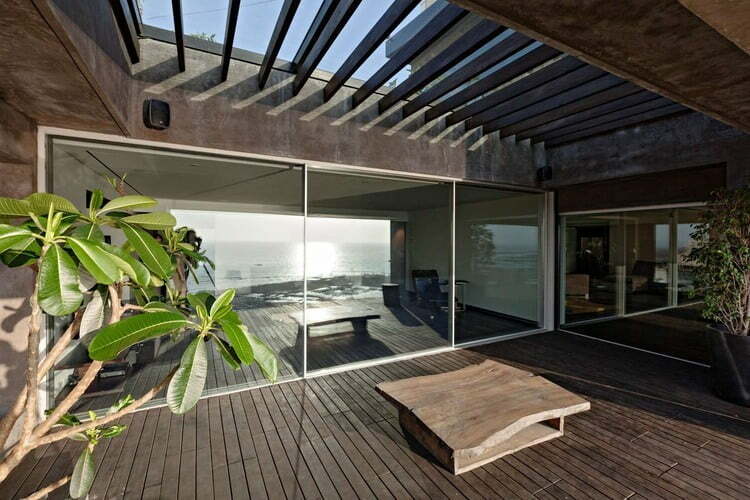 The living area & the bedroom face the sea to allow for evenings spent with the sunset. 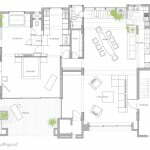 Being a bachelor home, additional bedrooms were dispensed with to allow for a large master bedroom, walk-in wardrobe, bathroom and terrace which could be made private. 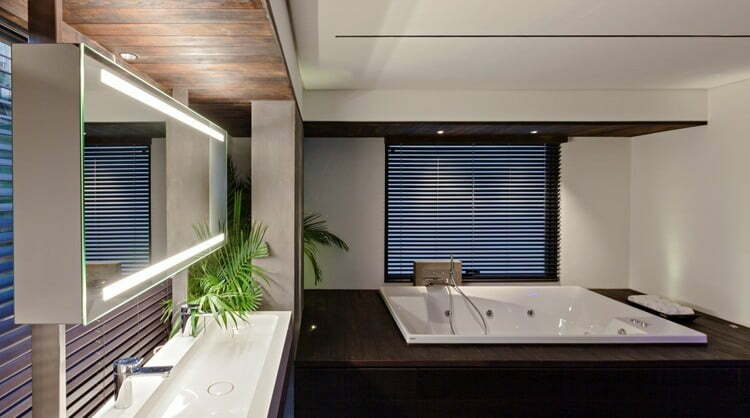 The project encapsulates cool, contemporary living in its modern design with equal attention to aesthetics and environmental sustainability, employing energy-efficient. 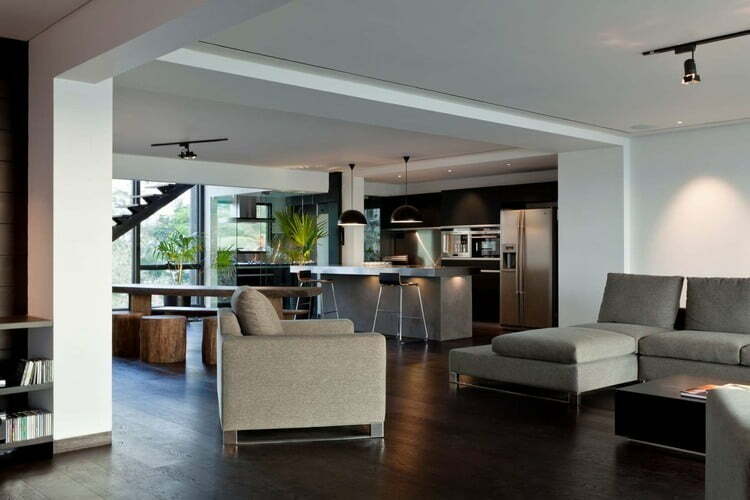 The open floor plan makes the living, dining & kitchen areas merge into one big lounge connecting views of the lashing waves of the sea and the shore line on the west to the glittering leaves of the trees of Mount Mary Hill on the east. The cold SS island contrasts with the otherwise warm colors and textures of the apartment. Visitors are encouraged to walk bare feet as is the custom. 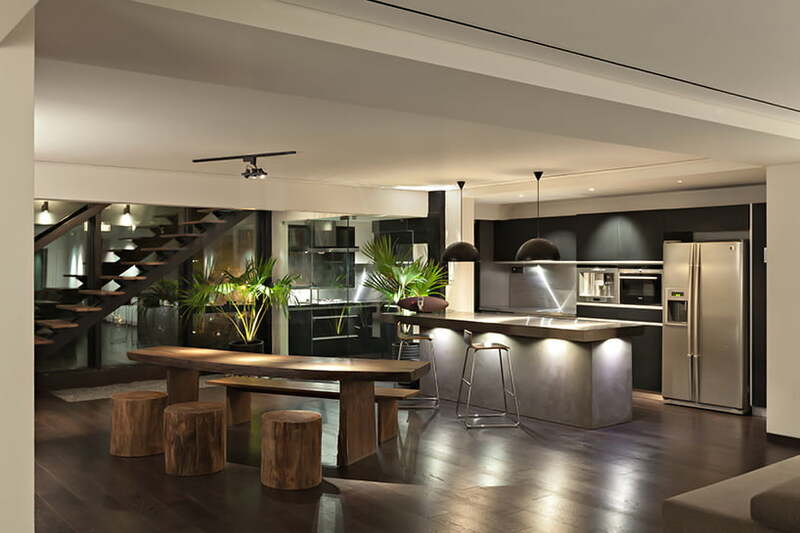 The dining table becomes the focal point for all activities in this relaxing apartment. 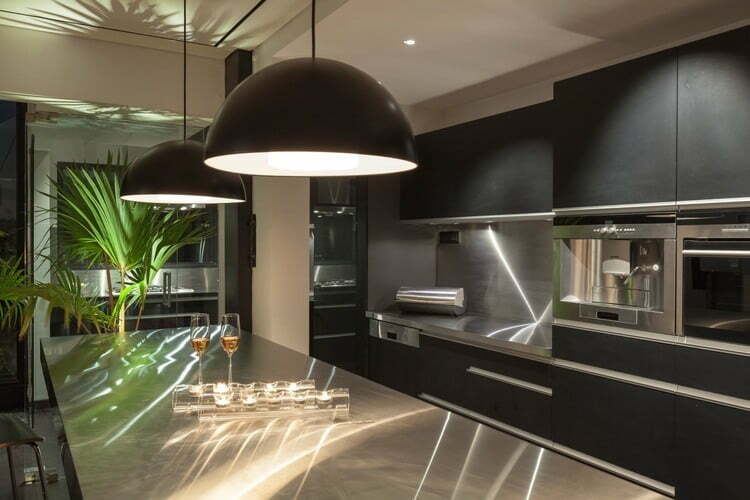 The black kitchen cabinet forms the perfect backdrop for dinner conversations and parties. 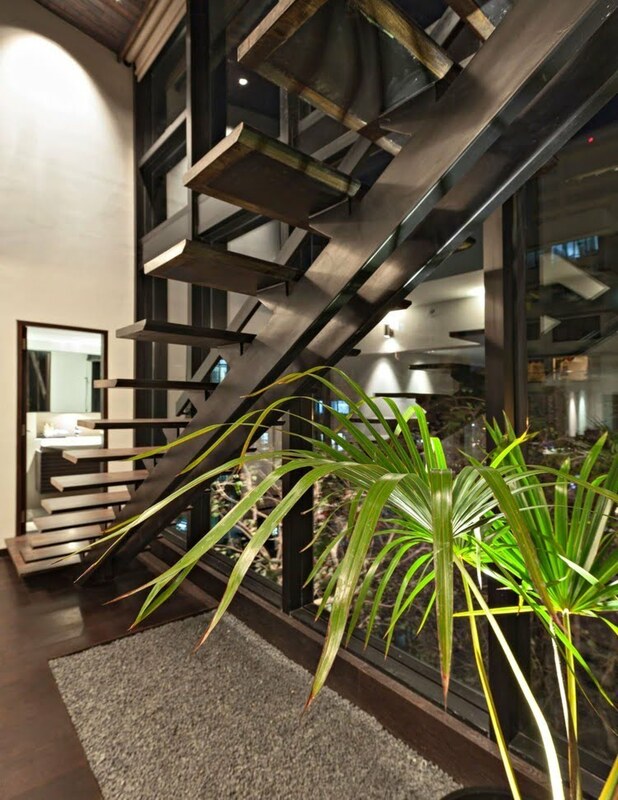 A balcony space was converted into a cantilevered wood & steel staircase set against imposing double height windows, visually & physically connecting the upper & lower volumes that were previously disconnected. 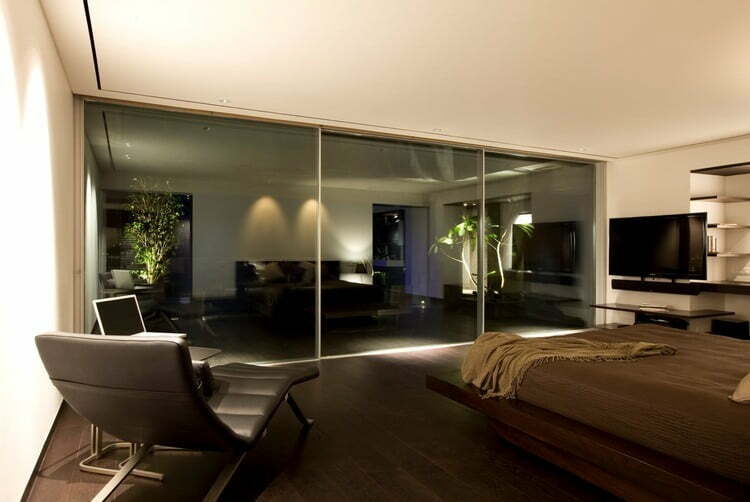 Automated blinds span the double height volume. 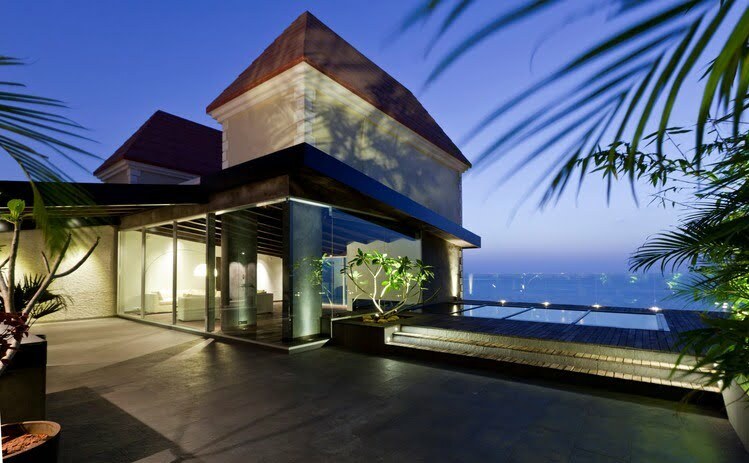 The master bedroom suite overlooks the sky lit terrace, with spectacular views of the Arabian sea. 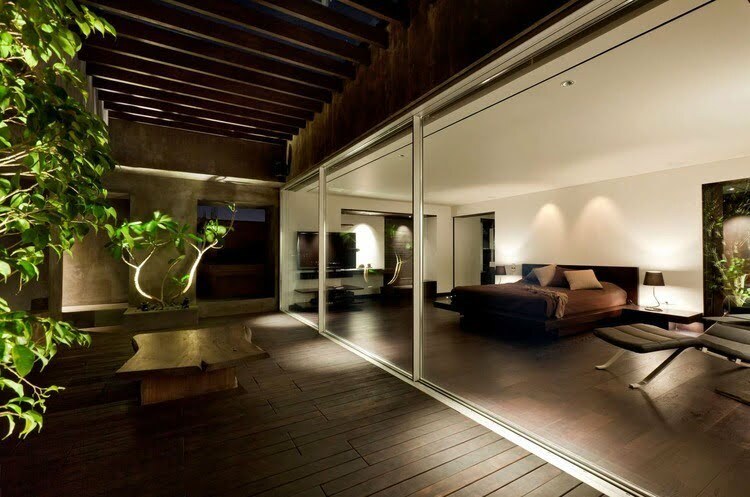 The skylight and pergola protect from the tropical sun and the seasonal monsoon rains. 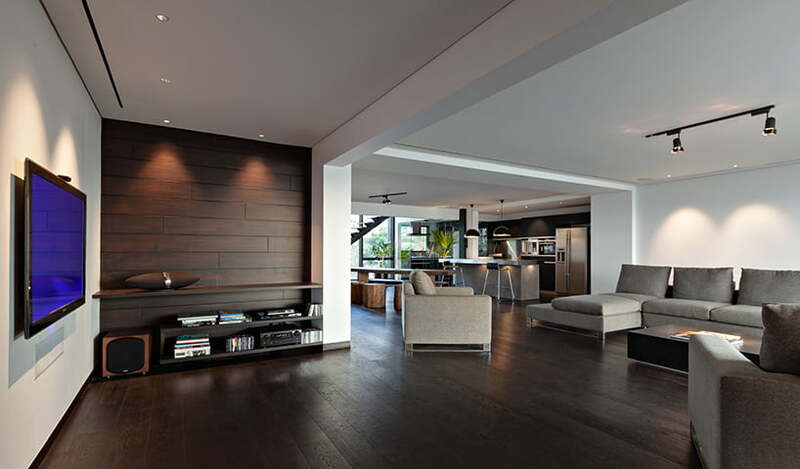 The flooring pattern enhances the line of sight and continues from indoors to outdoors: dark stained wooden floors and teak wooden deck add drama to each room, offering a personal elegance to everyday spaces. The master bedroom suite includes a private sea-facing terrace, a lavish walk-in wardrobe & an open plan spa bathroom – a fluidity of private spaces that retain total privacy while blending with the landscape. 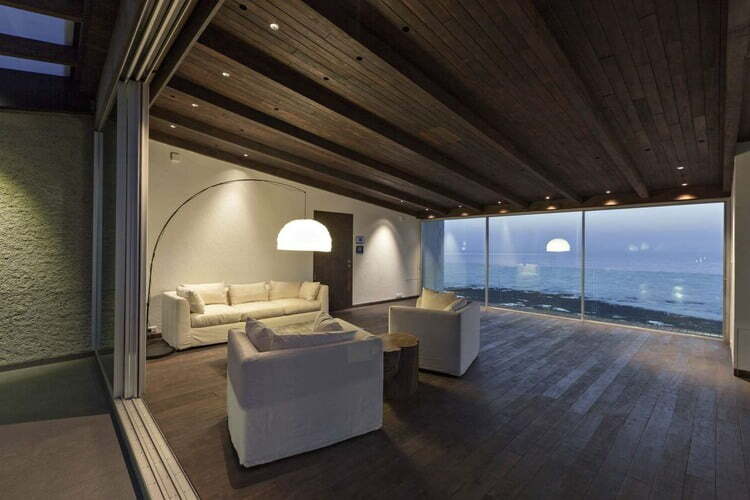 The hi-tech glass walled media room on top complete with a large size projector screen, concealed ac, av & automation, blurs the boundary between indoors and outdoors to expand the home’s sense of space: it overlooks the sea as well as a spacious wooden deck with a walk-on glass skylight. The luxuriant terrace garden serves as an expansive outdoor entertaining area with artful illumination and an open bar – a real hotspot. automated roller blinds concealed in the roofing convert the open media room into a large, yet cosy home theater for movies, F1 & football matches. The home fits within its tropical seaside context and encourages sustainability: reclaimed sleeper wood for garden screens & pergolas, natural stone, recycled tiles, high efficiency mechanical systems, durable engineered wood & natural fabrics; automation with mood lighting, power saving & curtain control, solar heaters & evergreen terrace gardens. Interior solar shades & large double-glazed sliding windows allow natural ventilation, uninterrupted views & access to landscaped areas, while cutting down on solar radiation and air-conditioning load. 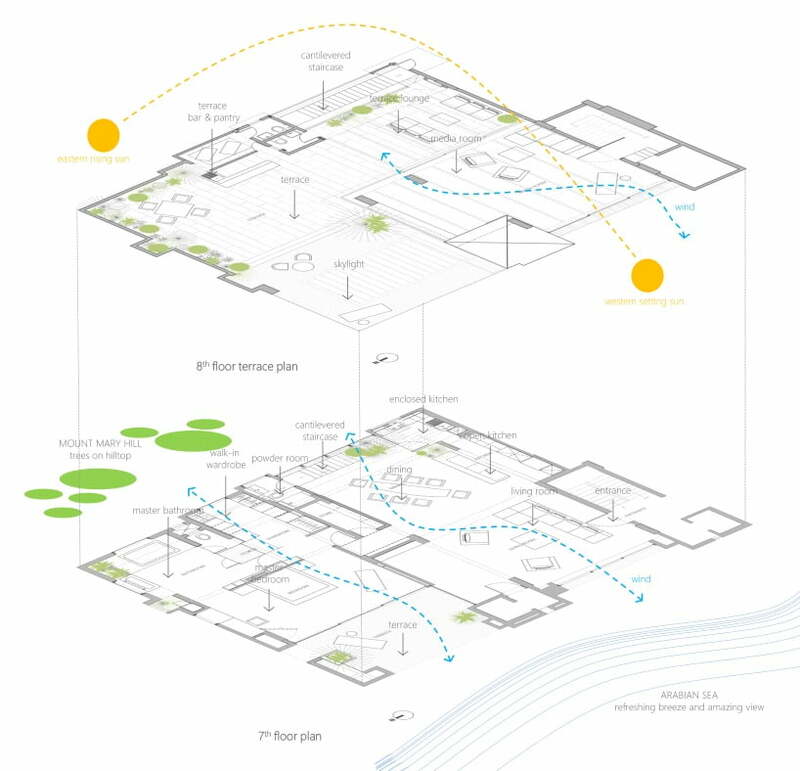 A limited palette of complementary materials ensures consistency in design & minimizes maintenance, adding warmth and texture through light & shadow. 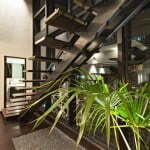 the interiors are finely detailed with custom-made furniture. materials used accentuate warmth & transparency.